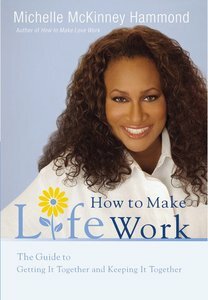 Bestselling diva Michelle McKinney Hammond dishes on her tips for making the most of every day in this sassy "owner's guide" to living the life you want.< BR /> < BR /> Are circumstances of life pushing you around? Are you tired of feeling like a victim? It's time to stand up and live large In this hands-on owners guide to life, Michelle McKinney Hammond teaches you to take a deep breath, stand tall, and take charge of your situation. < BR /> Taking a look at readers' innate gifts, Michelle studies the clues to finding our purpose, nurturing our spirits, minds, and bodies, and establishing balance in our many different relationships. Through it all, Michelle gives us a refreshing picture of what life is supposed to look like according to the Manufacturer's design. HOW TO MAKE LIFE WORK includes a fun, high-design interior that makes it a breezy, playful read. About "How to Make Life Work"